Since Friday was DEAR day (Drop Everything And Read) Rachel launched her Reading and Creative writers club this weekend. They read stories and started writing stories of their own. Sunday afternoon they returned for bible study and more creative writing. It is inspiring to see the desire these children have for reading and writing. Their prayer request this weekend was that each of them could receive bibles. Thank you to everyone who has donated books and bibles to the children of Ramona’s Reach!! This is a recent newsletter sent out by Jonathan & Rachel reflecting on their last 12 months in Pamora. Even though I haven’t updated this page in awhile there’s still lots going on in Pamora. 1,000 kg of masavu beans were recently purchased to help feed the children. Hopefully that will be enough beans to last for the first term of school. If we buy food in large quantities we are able to save money, 1,000 kg of beans costs roughly $825 CAD. PTA meetings at the Ramonas Education Centre also happened recently. Like many meetings in Pamora they met outside under a tree. While the walls were being built classes were held outside under a tree. Obviously it’s a little warmer in Pamora this morning than in Manitoba! Thank you to everyone who came out and made the hockey fundraiser a huge success! We raised over $13,000 for Ramonas Reach! Congratulations to Senegal for winning the 5 on 5 tournament and to Ankelbenders for winning the 3 on 3 tournament. The tournament has started! Come out and watch hockey or check out the silent auction and bake sale! A team of two from Manitoba are currently in Pamora. They went to Uganda to maintain and strengthen relationships with different leaders as well as with the locals. They say it is very hot and only cools down slightly for night. Pray for them that they will be an encouragement as they travel and have meetings. These are some of the pictures they’ve taken. The annual Ramona’s Reach hockey fundraiser is happening on January 26 &27! If you are interested in playing this year there are several different playing options. We will have the regularly run tournament on Saturday and Sunday, a girls only game on Saturday, as well as a 3 on 3 tournament were you sign up your own team. There will also be a large silent auction as well as a bake sale going on throughout the weekend. Stay tuned for more information as we get closer to the event. Here are several projects we are currently working on or planning on working on next year. We thank everyone for their tremendous support throughout 2018! Some of the children that attend the Ramona’s Reach school come from far away and they are heading home today for the holiday break. More pictures of the sponsored children drawing, writing letters, and creating art for their sponsors. -The fence has been completed with a beautiful front gate. -The first crop of green vegetables are growing nicely. Ready for weeding. They have already harvested some for the children to eat. A lot of work has gone into making the land suitable for gardening. Just a heads up that the 9th annual Ramona’s Reach hockey tournament will be on January 26-27, 2019. Save that weekend and start getting excited! Stay tuned for more info as we get closer to the event. This week we would like to introduce to you our deputy head master at Ramona’s Education Center. His name is Alex and he has served in his role as deputy H.M. since the beginning of the year. In addition to his talents as a teacher he is also a good tailor. He has recently finished making uniforms for the children at the school in Pamora. Please take some time to pray for Alex this week. These photos were taken last week when the children received their uniforms. The kids were very excited about it. A huge thank you to all who supported the uniforms project. Meet our matron Christine. She has the very important job of taking care of the girls under sponsorship. She works tirelessly almost 24/7 caring for girls. You can imagine how difficult her job can be once a few of the children are sick and need a caregiver in the night. She is a pastors wife and provides spiritual guidance to the children, leading them in nightly prayers and teaching Sunday school lessons on weekends. We are very thankful for the work she does and the wonderful care she provides. Please pray for Christine that God will continue to give her everything she needs as she serves the children of Ramona’s Reach on a daily basis. This week we would like to show our appreciation for Sam. He is another one of our long serving staff at Ramona’s Reach. He is our project accountant and this year has begun serving as the school bursar in charge of the school finances. Behind his quiet exterior Sam has a heart for the children and for the community of Pamora. He is also dedicated to continuing his education and is presently working towards his degree in business administration by taking weekend classes. Please take time this week to pray for Sam and his family. At Ramona’s Reach we value the hard work of each of our staff. This is Santo, he has worked with us for a few months as the assistant cook. He assisted with the very hard work of mixing Posho, maize flour mixed with boiling water to make the staple food at the school. Mixing the amounts required for the dormitory is very hard work and we greatly appreciate his efforts! Please keep these members of our support staff in your prayers. The work they do is critical for the welfare of the children we are supporting. This week we would like to introduce you to a member of the community in Pamora. This is Coach Noel. Noel has spearheaded the development of the soccer field at Ramona’s Reach. Until recently, the community members did not have an space available to use for a soccer field, the last space they had been using was taken up for other developments a few years ago. Coach Noel has been the central figure in rallying the community members into landscaping the area that is now the soccer field. He has also organized the community members into forming a team called Ramona’s FC. You can find this young team practicing most evenings and they hope to soon be able to join a local league in the future. We are happy that the school has finally received the additional students desks that we needed! These were made at a slightly larger size to help accommodate the children as they get into the higher grades. We also got some of the teachers desks and teachers chairs! We hope that the teachers take this as a sign of our support and encouragement. I love that we are able to continue supporting the school with these important infrastructure items that help the teachers and students do their respective tasks better! For others who feel strongly about supporting these sorts of developments it might help them to know that they can help provide a students desk (fits 2-3 students) for $55 and a teachers desk and chair for $155 Canadian. As the school grows we will continue to need more of these desks especially for teachers since the Nursery school classes still don’t have teachers desks. Today we want to profile Jonathan and Rachel! Jonathan & Rachel Kurkilahti were hired by Ramona’s Reach in January 2018. Rachel is from Uganda where she is a social worker and Jonathan is originally from Toronto, Canada, and has construction experience. In the 9 months they have been in Pamora, significant positive changes have happened. They have been very busy! We have loved having Jonathan and Rachel in Pamora. Jonathan has been very involved in all the different construction projects that have been and continue to be occurring in Pamora. Rachel has has been involved in the children’s home and school and helping out where needed. On September 20th Rachel gave birth to their second child! Please continue to keep Rachel and Jonathan in your prayers as it’s not always easy to raise their young family in a new place. We hugely appreciate them as they pour their hearts into the people of Pamora. This weeks person of interest is Raphael. Raphael has been with us at Ramona’s Reach since the beginning. He is a retired police officer who is extremely active in his church community in Pamora. His wisdom and experience is extremely valuable to us at Ramona’s Reach. He currently serves us by chairing our Ramona’s Reach monthly team meetings! This week we are highlighting our newest team member, Brenda. Brenda has a degree in Child development and children’s ministry. In her free time she likes to teach Sunday school at church. She has a passion for working with children and has already made a positive impact on the team in Pamora and we know that her work with the children will make a lasting positive impact in their lives. Gladys joined Ramonas Reach in 2016 and has been very instrumental in making Ramona’s Reach run more smoothly and more efficiently. Gladys has been the Ramona’s Reach administrator for the last 2 years. She was a helping hand to the teachers and to the nannies, and made herself available wherever there was a need. Gladys is leaving us to get married in September and today is technically her last day of work for Ramona’s Reach. We will miss her cheerful smile, caring heart and her willing spirit. We wish her all the best in the next chapter of her life! Lots of projects are getting wrapped up in Pamora! The last section of fence is done, the toilets are primed, the toilet water tank is full of rain water, and construction on the front gate wall and the guard house is underway. The rain water of the bathroom roofs fill this tank. The last section of fence is now completed. Foundation for the front gate and guardhouse has begun. We are sending out this note to those who may have an interest in contributing toward children’s uniforms. There is an opportunity to send additional donations to Ramona’s Reach for the children’s school uniforms. The girls’ uniforms will consist of dresses/skirts and shirts. The boys’ uniforms will consist of shirts and pants. If this is something you would like to contribute to you can contact me via email at carlieandgreg@gmail.com. There is no pressure in this offer, but we would like to give you the option! This week meet Nereo. He is one of our security guards. He has served us for several years. Until recently he worked alone as our only guard and night watchman. He is a real craftsman, you will often find him making a new bow and arrow or slingshot to help give him protection at night. Weekly profile #2 showcasing some of the people working at Ramona’s Reach in Pamora. Meet Solomon!! He is the warden in the boys room. He serves as the immediate parent to the children in the children’s home. Solomon enjoys playing the harp at the local church and he is involved with the choir. He also leads the children in night time devotions. I have an opportunity for you to help out with Ramona’s Reach! There are currently 3 children who are not sponsored. If you or someone you know would like more information please contact me at carlieandgreg@gmail.com. I’d love to tell you more about these children! We are planning to start a series of profiles introducing you to the awesome people who are involved in the work of Ramona’s Reach in Pamora. Look for a new profile every week! This is Esther, our chief cook. Esther is responsible for preparing all the meals for our children staying in the dormitory. She slaves over the hot fire 7 days a week to make sure the kids have hot meals to eat. Almost any time you visit Ramona’s Reach in Pamora you will find her in the kitchen working away. She also enjoys singing in the church choir and her cheerful smile rarely leaves her face. Esther’s service to us and her passion to help the children are priceless. The bathrooms for the school are almost done! We recently installed a pump and several water tanks to bring running water to the children’s home as well as Jonathan & Rachel’s home. After some delays the water began flowing on Wednesday! The children are very excited that they won’t have to carry water by hand anymore! The kid’s love eating silver fish whenever they get the chance. This is the soccer pitch. They have been working very hard to level it and slash the grass. They have also removed the old church building to make space for the field. After watering the newly planted trees the water cans turn into instruments! A solar system was installed for the guest house last week! 50 orange and mango seedlings have been planted close to the guest house that is being built. Even though I haven’t posted any updates in a few weeks lots is going on in Pamora. School has started again for the year, and we have more children attending than we have room for! We have began construction on a large bathroom for the school children and the perimeter fence is almost complete. The pit for the school toilets septic tank being constructed. Cutting the grass to prepare for the start of the school year. The perimeter fence is almost done! Some recent pictures from Pamora. When the team was in Pamora last month they installed two large water tanks with eavestrough‘s that directs the rainwater into the tanks to be used later. Time for a game of soccer! Thank you to the women’s EMCup for your support of Ramona’s Reach! Today I received multiple donation cheques and recently they committed as a group to sponsoring a child staying in the children’s home. Here are some recent pictures of children attending school in Pamora. I will post a lot of updates of the current trip on Facebook. Today a team of 9 from Seminole, Texas and 3 from Arborg left for Africa. The group of 12 are planning to spend 9 days in Pamora. The specific project they are focusing on will be building the perimeter fence around the Ramona’s Reach compound. Cement posts have been built and delivered and the chain link is ready to go. They will also be spending lots of time in the school and children’s home building relationships and helping where needed. Please pray for them as they spend roughly 30 hours in airports/flying. Pray for safety and health, and that they will be a blessing and encouragement to the people of Pamora. In February, 14 more children moved into the children’s home. Not all of these children are true orphans. We are working with the most vulnerable children in the area surrounding Pamora. In the local communities, and in Uganda in general, these children are considered to be “orphans”. We have found that many of them have some loose ties to family, extended family, or community connections, even though they currently do not receive adequate care. In light of this, we are putting more emphasis on becoming a school that cares for the most vulnerable children. The children’s home is a boarding home where children from the most vulnerable situations stay while school is in session. We will care for them and educate them while advocating for permanent family ties and long term plans for each of them. Huge thank-you to everyone who came out and made the 8th annual Ramona’s Reach Hockey Tournament another big success! We raised $10,500 for the disadvantaged in Africa! We’ll see you all again next year for the 9th annual tournament!! They are hard at work in Pamora! The finished brick. Now it needs 30 days in the sun to cure. We have provided training to some locals on how to use the new brick maker. This brick maker makes much more uniform and consistent brick. The foundation for the guest house is almost done! The completed house will be used by Jonathan & Rachel while they live in Pamora. Rebar getting delivered. Can’t imagine how the shocks looked after traveling on the rough roads for miles. Soon the empty classrooms will be bustling with children when classes start on Monday! Last year we purchased a play structure for the children. It was finally installed and is ready for use! Construction has begun on the house project! We are really excited that Jonathan & Rachel Kurkilahti have recently been hired and have moved to Pamora to help with the Ramona’s Reach project! Rachel is from Uganda where she is a social worker and Jonathan is originally from Toronto, Canada and has construction experience. We think they will be a perfect fit in Pamora as Jonathan will be in charge of construction projects and Rachel will help with the orphans in the chilren’s home. Jonathan has already begun the preliminary work of building the guest house and is working on buying material for the construction of the perimeter fence around the Ramona’s Reach project. We are really excited to have them as part of our team in Uganda! Start getting excited for the 8th Annual Ramona’s Reach Hockey Tournament! The tournament will be held in Arborg on Feb 17-18, for more information or to register to play click here. Here are several projects we are currently working on or planning on working on next year. We thank everyone for their tremendous support throughout 2017! Yesterday it was 8 years since Ramona passed away. It’s crazy how time flies, but it’s also amazing how so much has happened in Africa in so short a time. I love how God can use something terrible like Ramona’s death and create something beautiful out of it. Thank-you to everyone who is partnering with us as we work together to care for the people of Pamora! They sent another thank-you video today…..
We recently sent a short powerpoint presentation to a church in Texas that has expressed a lot of interest in forming a team to go to Pamora to do a work project. If you are interested you can view the presentation here. We recently told the Ramona’s Reach board in Pamora to start looking into bringing more children into the children’s home. We currently have 24 children and are planning on added 16 more in the next few months. The need is tremendous, and we want to do whatever we can to help. If you are interested in partnering with us, we will be looking for sponsors for the new children as they join us in the children’s home. Here are some pictures we recently received from Pamora. -Brand new uniforms for the orphans ! -Thank-you to the Morweena school students for donating money to pay for trees to be planted on the Ramona’s Reach grounds. -The orphans posing with new sheets for their beds. -Two of the orphans have malaria and are at the hospital getting treated. Freshly planted potato field to help provide food to feed the orphans. Check https://www.facebook.com/events/1320435601418141/ for more information about the street hockey tournament, including teams and schedule. 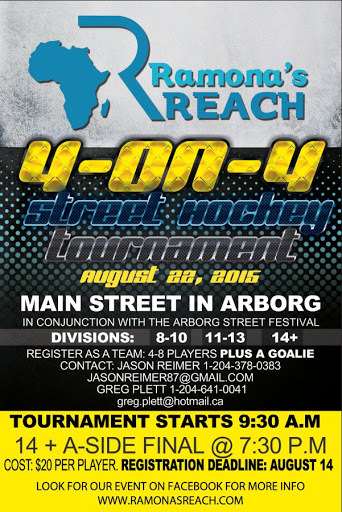 Come out and support Ramona’s Reach at the annual street hockey tournament held on main street in Arborg. Recently the Dalhart Mennonite Evangelical Church in Texas contacted us to let us know that they were running a VBS program for the children of their church and area. They had put out a challenge to the children to donate money for Ramona’s Reach and to make things interesting they had a competition for who could raise the most money, boys or girls. In the end the girls beat the boys by over $300.00. Together the boys and girls VBS group raised a total of $3,600.00! Thank-you so much to the people and children of Dalhart! The orphans wearing their new uniforms! The school construction is pretty much complete! Thank-you for your continued support of Ramona’s Reach. A team recently returned from Pamora and they had a very good report of their time there. They reported that the school and children’s home are running well and the people seem mostly happy and healthy. I hope to post some pictures and a better report of their trip soon. Recently one of our board members had the opportunity to travel to several churches and communities in Kansas and Texas and report on his recent trip to Uganda. We were blown away by the support and interest that was expressed for the work that Ramona’s Reach is doing in Pamora. Thank-you to the people of Dalhart TX, Copeland KS, and Seminole TX for your interest and support. Eleven orphans where sponsored, money was donated and relationships were made. We look forward to working together to continue to help the people of Pamora! A huge thank-you to the players and fans at this years women’s EMCup who raised money for Ramona’s Reach. Together they donated over $2,000! When the children aren’t in school they love to play soccer! The 24 orphans living in the children’s home in their new Ramona’s Reach shirts! These pictures taken on Feb 22 show workers plastering the school. Both the inside and outside of the school are being plastered and painted. Thank-you to all our donors for all the money that came in at the end of 2016 to make this project possible! Thank-you to those who came out and supported us at this years hockey tournament. We raised over $15,500! Money that will be used to help run the school and children’s home in Pamora. The 7th annual hockey tournament is less than 1 week away! Click HERE for teams and schedules. Thank-you to our donors for your recent financial support for the school. We are moving ahead with finishing the school, including new desks and blackboards. The windows and doors have been installed and we are starting to have both the interior and exterior plastered. Classes resume on Feb 6 so we hope to have the building completely plastered by then. This is the recently completed kitchen. We use the kitchen to cook food for the orphans as well as for our porridge program for the students at the school. We are very excited to be bringing in 13 more orphans into the children’s home! The children have all been selected, food and beds are being purchased and the legal paperwork is being finalized. We are hoping to have them living in the children’s home within 10 days. Once we have the children living in the children’s home we will be working on creating profiles and sponsoring the children. Start getting excited for the 7th Annual Ramona’s Reach Hockey Tournament fundraiser! The tournament will be held in Arborg on Feb 4th to 5th. Stay tuned for more information. Thank-you to everyone for your support during 2016! We are looking forward to another good year as we work with the people in Pamora. Eleven year old Heaven Loewen has been making toques and selling them to raise money for Ramona’s Reach. For Christmas she also asked her brothers, sisters, nieces and nephews to join her and put money in a stocking for the children at the school in Pamora. Together they donated over $280 toward Ramona’s Reach! Here are some of the things we are currently working on and actively raising money for. We hadn’t been focusing a lot of time or money towards the school until the children’s home was running well. Now that the children’s home is running well we want to get the school running smoothly and well supplied. If you are interested in supporting these project’s you can either write a cheque or donate online. See the donate tab for more info. The team arrived back home in Manitoba after a productive trip. Thank-you for the prayers and support. Stay tuned for an update and pictures. Please think and pray for our team heading to Africa from Manitoba. They arrive in Africa today and will be there for around 10 days. The wife of the Ramona’s Reach board member is still sick and in hospital but seems to be getting a little better. Please pray for one of the members of our Ramona’s Reach Uganda board. His young son passed away 2 days ago and his 8 month pregnant wife is in critical condition in the hospital. All the children have been sponsored! Thank-you to everyone for the overwhelming support and interest in helping the children in Uganda. Thank-you for all the interest, the trip for two to Florida has been sold! Bids must be submitted on Facebook in this feed to allow everyone to keep track. We’ll open this up for public viewing if you want to share it. Bids on behalf of someone who’s not on Facebook will be accepted, but again, they must be posted on here. Bidding closes on Oct 3rd, 2016, a week from today at noon CST. Payment must be made within 7 days, and I in turn will make an equal donation immediately to Ramona’s Reach. There is a reserve bid of $1000 (a fraction of what it’s worth), with bid increments of at least $50. 7 night stay in Groveland, Florida condo – many winter weeks remain, but the holiday season and spring break are not available. If you’re wondering about a specific week before placing your bid, please ask. Go to https://www.facebook.com/groups/110062019340527/ to bid!! We are very excited to be starting a sponsorship program for all the orphans! Click on the pictures of the children to see their sponsorship info and more information on each child. If you are interested in sponsoring a child, fill out the form below and send it to Ramona’s Reach. See a video of James Reimer discussing his recent trade to San Jose. Watch starting at 4:40 where he talks about Ramona and Ramona’s Reach! Thank-you to everyone who came out and made the hockey tournament another huge success this year! We had a large bakesale. We are building a cooking house where our hired cook will make food for the children living in the children’s home. Cement arriving at the site. We store the building material in the newly constructed storage shed. We hire as many locals as possible to help with construction. We have purchased beds and mattresses for the first children that are going to be living in the children’s home. Get excited, the annual hockey tournament is almost here! The roof of the school is on! Thank-you so much for the support throughout 2015. We had a very busy year of building and anticipate a busy 2016 as well. Start getting excited for the Ramona’s Reach 6th annual ice hockey tournament! This year it will be on February 27-28. Stay tuned for more information. When the team was in Pamora late last month, they had an opportunity to help drill a well for a village approximately half an hour from Pamora village (where our project is). The well was drilled a few hundred feet from the Congo – Ugandan border for a very poor village. In the past the villagers had been forced to walk 6 km for clean water or use water from a much closer dirty ditch. A donor had expressed a desire to donate money specifically towards drilling a well and we knew of this nearby village that desperately needed a well. So Ramona’s Reach, both in Canada as well as our board in Uganda, made the necessary arrangements and scheduled the well drilling truck. It worked out perfectly that the team from Canada was in Pamora exactly when the well was started. It was an incredibly rewarding experience for the team as many people would stand around for hours and watch as the well was being drilled, the look on their faces of joy and excitement was awesome to see. Below you will see pictures of where the people would get their water from in the past. The water they would usually drink was from a filthy ditch where the animals would drink as well. The donation we received didn’t quite cover the entire cost of drilling the well and installing the pump ($10,000 CDN). If you wish to help donate toward that project please specify “well project” on your donations. This is where they usually would get their drinking water from before the well was drilled. The stream where the people would get their water was essentially just a filthy ditch. Drilling the well. Due to the extremely rocky soil the well drilling truck has to come from Kampala city, approximately a 7 hr drive away. An interesting “coincidence” is that the date on the well is exactly 6 years from the date of Ramona’s death. We received a letter of appreciation from the village/community leader from where the well was drilled. The school’s roof is being built! On the left you can see the new outhouses, in the middle is a storage shed, and on the right you can see the children’s home. Today we received more pictures of the progress they are making on the school! Looks like they are almost ready to put on the roof! One week ago a team returned from their visit to Pamora, Uganda. One of their top priorities was finalizing the legal paperwork to bring children into the children’s home. They made a lot of progress, however, things don’t always move quite as quickly as we would hope. The goal is still to have children in the children’s house by the end of 2015, however that may be a fairly optimistic timeline. Even if it doesn’t happen until early 2016, we are working hard to help the orphans of the area. The team was once again overwhelmed by the need and the poverty they saw. The school year is over in Uganda and they resume classes in February. Instead of having classes in the children’s home as they have been doing, they will be able to start next year’s classes in a brand new school! While the team was in Pamora, they saw the new school’s foundation finished and the walls begin to be built! We are very excited to see the progress of the project in Africa. As we near the year’s end, please consider supporting our project in Pamora, Uganda as we work to help take care of and educate the under privileged in Pamora. We anticipate a very busy 2016 as we finally bring children into the children’s home as well as complete the school. We are very excited that we have finally received the official stamped blueprints for both the school as well as a guesthouse! We are hoping to begin construction on the school very soon. The initial plan is to build a 3 room school and if needed we can easily add additional classrooms to either side. We are always looking for people who want to partner with us financially as we work toward completing these projects to help the disadvantaged in Pamora. If you are interested or want additional information feel free to contact us or help us by donating to the project. Thank-you to everyone who came out and made the street hockey tournament a big success! The children’s home is officially finished! Now we are waiting for the blueprints for the school to be finalized so we can start working on building the school. The completed children’s home will continue to be used for school classrooms for up to 140 students until the school can be built. We are excited as we are quickly making progress on the children’s home. The final coats of paint are going on! One more coat of exterior paint needed. We are very excited that construction is underway again. We have hired around 30 people who are hard at work on completing the Children’s home. The children who where attending school in the children’s home are on a 1 month break so they are trying to get as much done as possible during their spring break. The people of Pamora are so excited that construction has begun again! Thank-you to everyone for once again making the hockey tournament a huge success. We made $12,058.85 profit!! See some pictures from our latest trip to Pamora!! Start getting excited about this year’s 5th annual hockey fundraiser!! Sign up to play in the Ramona’s Reach all-night hockey tournament at the Arborg Arena by contacting Jason Reimer via facebook message or email (jason.reimer.87@gmail.com). There will be girls-only games as well as a 12 and under ice time (exact time to be determined). Sign up deadline will be Saturday, Mar. 21 at 11:59 pm. Individual fee is $40.00 to play in the full tournament, $10.00 per game for girls-only games. Teams and schedule will be released on Sunday, Mar. 22. Tournament will take place on Mar. 28-29. Scheduled games will run from approximately 2:00 pm Saturday until 5:00 am Sunday, then Sunday afternoon from 1:00 pm until 6-6:30 pm. There will be 8 teams capped at 13 skaters each, so sign up early to make sure you make it on to a roster. For more info, contact Kevin Petkau, Randy Petkau, Jason Reimer or Earl Reimer. –We partnered with Action International Ministries. They bring many years of experience in missions all over the world and currently have 250 full-time missionaries in 25 countries. -We have been temporarily using the childrens home as a school for local children. We had as many as 144 students. We are currently supporting 4 licensed teachers to help educate the children. The students receive a porridge breakfast daily. fundraiser. Thank you for your support! -Ramona’s Reach has set up a board in Morweena with John Petkau, Abe Loewen, Arnold Reimer, Lorrie Reimer, and Kevin Petkau on the board. -After years of paper work Ramona’s Reach is finally registered in Uganda and is now recognized by the Ugandan government. We are finally able to have a bank account in Uganda and can move forward with future plans. – We have a Ugandan board with three men appointed to the board. – The well has been repaired after numerous lengths of pipe rusted. – We are in the planning stages of building a school. We hope to have it up and running in 2015. Once the school is completed we can begin the process of placing orphans in the children’s home. -Overnight ice hockey fundraiser tournament March 27-28 and probably another street hockey fundraiser in summer. We want to thank everyone for the support and interest you have shown Ramona’s Reach. If you have any questions please feel free to talk to us. You can continue supporting Ramona’s Reach by praying for us, consider joining us on a missions trip, or by supporting us financially. The team from Manitoba arrived safely in Pamora early this morning. Exciting update… Next week a team from Manitoba will be traveling to Uganda. Stay tuned for more info. We are very pleased to announce that we have partnered with Action International Ministries. We are excited as Action International is a large mission with over 250 missionaries (and many other team members) in 25 countries. They have multiple teams already working in Uganda and they have a wealth of experience that we can draw on. All charitable donations will be going through Action International Ministries. To learn more about Action International Ministries click here to go to their website. Ramona’s Reach is planning a fundraiser 4-on-4 street hockey tournament to be held on main street in Arborg on August 23rd. For more information click here. I just got back from Pamora, and had an amazing trip. We brought money to continue the construction of the children’s home. The roof is completed, the doors and windows have been ordered, plumbing and electrical is being started and the walls will be plastered to complete the project. For the past number of months this building has been used as a school to educate over 100 students whose parents can’t afford to send them to the local school. These kids have been coming early and receiving a porridge breakfast before classes begin every morning. While I was there I saw the students write their final exam before school breaks for a few months. The people in Pamora are happy and optimistic and are putting more effort into growing gardens and small crops but I also saw how they struggle with sickness and disease. I’m excited about the continuation of this project. I see so much need and many grateful Ugandans who are also excited to see positive change in their community. It is nearing the Christmas season, and as we prepare to celebrate Christ’s birth with family and friends we are reminded of all the things we are blessed with. There are many children around the world who this season will not have family to celebrate with, and who would feel so blessed to just have food in their bellies. As we reflect on all this season means we’d like to share a few of the things that are happening with Ramona’s Reach. In the summer of this year the roof of the children’s home in Pamora was put on. It is exciting to see such noticeable progress in the building of the home. There are still a few finishes such as windows and doors that need to be completed before children will be able to move in to the home. The home also needs to be furnished and children selected. At the end of November of this year a team from Canada arrived in Uganda to participate in another crusade and to continue planning for the next phase of the Ramona’s Reach children’s home. They are expected to return within the next week or so. More in-depth details concerning the progress will be available once they return. In other exciting Ramona’s Reach news we are looking forward to another annual all-night hockey tournament which is being planned for January 11-12 2014. We have not updated you on the Pamora Project for a while, so I would like to just fill you in on some of the happenings that are going on. Last summer(2012) we were there to start the building of the walls of the children’s home, after we left they completed the building up to the gables. In November of that same year a big crusade was held in the area, and hundreds of people attended. Many many souls were drawn closer to Jesus Christ. So although the actual structure of the children’s home has not progressed, many souls have been touched, and a lot of spiritual growth has happened. school building. Children have been eagerly coming, and are learning academic skills, singing and playing together. The last I heard they had an enrollment of 147 students! How incredible! I think this is a beautiful picture of how excited and encouraged the Africans become, when given some extra help and support, and an occasional visit. The money that you have donated will have life long value in the lives of the people there. The money for the roof and the completion of the building will be given to them shortly. and the progression of the children’s home will continue. August 1, 2012The orphanage is making progress, all walls are now built! The first day we were there we went to Jinja, to the slums. It was a very heartbreaking place to visit. The destitute and needy children living in extreme poverty and very dirty conditions were desperate for love and attention. We blessed them by giving them hugs, holding their hands, and singing with them. The mothers were also so desperate and yearning for help. We were able to pray for some specific mothers. I had the privilege of holding a baby in my arms for quite some time while we walked around from place to place. When it was time for us to leave I wanted to give the baby back to the mother. She did not want to take the baby back but spoke to our interpreter and told her she wanted me to pray for the baby and give her a name. I felt really honoured and prayed for her dear baby. The interpreter thought the baby’s name should be Carol after me. So we left it at that, said good-bye and were about to leave, when one of our team members said to me, “Carol, why don’t you name the baby Ramona after your daughter who passed away?” I thought that was a good idea, so we hurried back to the mother. We told her about Ramona, and about her dream for Africa, and if she could name the baby Ramona. The mother was touched and said she would name the baby Carol Ramona. Wow! What a powerful experience. Think of it-a beautiful little African girl named Ramona growing up in the slums of Uganda. Who knows what God will do through her. After a few nights in Kampala, we took the bus to Pamora. A number of men met us at the bus stop with the truck that was purchased a few months ago. They had put benches in the box of the truck, and we got a ride in the back with our luggage for the 7 km from the highway to Pamora. How very good it was to be back there again. Such wonderful, giving, and caring people, who welcomed us, made us feel at home, gave us a place to sleep and fed us. We were able to help with putting down the first bricks of the children’s home. Bricks, sand, and cement were hauled with the truck. Many, many hands put lots of work into the building. Women carried water from the well we drilled last year for the men to mix the cement. Children helped with hauling bricks in wheelbarrows, or with pumping water. Men mixed the cement and did the brick laying. We tried to get in there and help along as best we could. It was a whole community event. It felt so good to be able to do something with our hands to help with the dire need we had seen earlier in the week. Building a home for 65 orphaned children. June 27, 2012 They’re home!! Everyone except for Lisa (who’s coming home on Friday) made it home safely today. Thank God for protection in travel and on their trip. Stay tuned for lots of pics as well as stories! June 22, 2012 Another update…possibly the last one before the team heads back home. The team continues to build the children’s home using bricks…the walls are going up. PTL!!! They will be attending a wedding sometime this weekend. On Sunday, the team will be attending church and Lisa will be speaking. On Monday they will all head back down to Kampala. PRAYER REQUESTS – One of the team members is not feeling well so please pray that God would bring restoration and healing! Pray for Lisa as she will be speaking at church on Sunday. As always, please pray for safety during travels. Thank you to everyone who has been supporting this team in prayer while they have been serving in Uganda. The Bible tells us in Matthew that “The harvest is plentiful but the workers are few.” Let’s praise God for ALL the workers who are spending themselves in the mission field. Let’s continue to lift them all up in prayer. God bless! June 21, 2012 The children’s home is well underway! Many bricks are being laid and a lot of cement is being poured. The building is coming up! This will be much more than just any building, it will change the lives of so many hopeless children. Thank you Ramona, for having such a beautiful dream! Thank you God, for making it happen! June 18, 2012 This weekend was full of things to do for the team! On Saturday they went to see some land that Hearstrings owns in Dei, a village bordering Congo. Also, all of the building supplies were purchased this weekend. The team went to some hospitals to visit the sick as well. Today they went to get the bricks so the building can get underway! Keep praying for God to continue to work in the hearts of those the team encounters. Pray that they would see that God is good, and that He is faithful! June 15, 2012 The team is safe and sound in Pamora! They were welcomed by people from the community and given their first of many meals consisting of rice and beans. The team has experienced God’s goodness in many ways already but the enemy has a way of discouraging when God’s work is being done. The team is in good spirits but is feeling some opposition. We praise God that he is stronger! Tomorrow morning, the first brick will be set in place for the start of the children’s home! June 12 2012, The team arrived in Kampala safe and sound. Thank God for protection in traveling. They are staying at a Dwelling Place guest house in Kampala city. June 11 2012, A team consisting of John and Carol Petkau, AJ Reimer, Philip Plett, Clarence Sinclair, and Julia head to Africa to meet up with Gord and Lisa who headed out to Uganda last week. A young couple from the U.S.A. will be meeting them in Kampala, Uganda and are planning to stay in Pamora for up to one year.The team is planning to begin the actual construction of the orphanage. The foundation is in place already and they plan on beginning the building stage with bricks as well as continue developing relationships and encouraging the people of the community in their walk with God. April 19th, 2012 We broke ground for the children’s home in Pamora Uganda! The foundation and slab for the floor will be completed, and we will be taking a team in June to work on the building. We also have purchased a truck for the project to haul all supplies needed. Praise God for his faithfulness. Thank you to all who have, fundraised, donated, prayed and encouraged us to walk out Isaiah 58:10! I just got back from Pamora, and had an amazing tip. We brought money to continue the construction of the children’s home. The roof is completed, the doors and windows have been ordered, plumbing and electrical is being started and the walls will be plastered to complete the project. The people in Pamora are happy and optimistic and are putting more effort into growing gardens and small crops but Ialso saw how they struggle with sickness and disease.